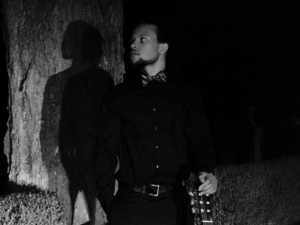 Frostburg State University student Corey Snowden will present his senior guitar recital on Friday, April 19, at 7:30 p.m. in the Pealer Recital Hall of FSU’s Woodward D. Pealer Performing Arts Center. Guest artists will include Ryan Barber on drums and Garrett Spence on bass. The recital is free and open to the public. Snowden’s program will include “Tico-Tico no fuba” by Zequinha de Abreu, “Bachianinha No. 1” by Paulinho Nogueira, “Giocoso IV, Op. 148” and “La Rose” and “L’Oilette” from “Choix de mes fleurs chéries, Op. 46” by Mauro Giuliani, “Sonata K. 322” by Domenico Scarlatti, “Jesu Joy of Man’s Desiring” and “Sleepers Wake” by Johann Sebastian Bach, “Across the Universe” by John Lennon and Paul McCartney, “One Note Samba” by Antonio Carlos Jobim and “Just Funky” by Tomo Fujita. “Tico-Tico no fubá” (“Sparrow in the Cornmeal’) is a Brazilian choro song de Abreu composed in 1917. Outside Brazil, the song reached its peak popularity in the 1940s, with successful recordings by Ethel Smith, The Andrews Sisters, Carmen Miranda and others. Brazilian guitarist, composer and singer Nogueira wrote “Bachianinha No.1” inspired, in part, by his fascination for Bach and in the Bachianinhas by Heitor Villa-Lobos. “Goicoso, Op. 148” is the fourth movement of “Giulianate,” by Italian composer Giuliani, a leading guitar virtuoso of the early 19th century. “La Rose” and “L’Oilette” are from the collection of 10 short pieces, “Choix de mes fleurs chéries, Op.46.” Each section is named for a flower, the beauty of which the composer tries to capture in musical terms. Some of the most charming music played on the guitar was originally composed for the keyboard by Scarlatti. His “Sonata K. 322” exhibits his simple but masterfully inventive style. “Jesu, Joy of Man’s Desiring” is the most common English title of a piece of music derived from a chorale setting of the cantata “Herz und Mund und Tat und Leben, BWV 147” (“Heart and Mouth and Deed and Life”), composed by Bach in 1723. “Wachet auf, ruft uns die Stimme” (“Awake, Calls the Voice to Us), also known as “Sleepers Wake,” is a church cantata by Bach, regarded as one of his most mature and popular sacred cantatas. He composed this cantata to complete his second annual cycle of chorale cantatas, begun in 1724. “Across the Universe” by Lennon and McCartney first appeared on the 1969 various artists’ charity compilation album, “No One’s Gonna Change Our World,” and later, in a different form, on their 1970 album, “Let It Be,” the group’s final released album. The song’s flavor was heavily influenced by Lennon’s and the Beatles’ interest in transcendental meditation. At FSU, Snowden studies under Patrick Sise. He is member of Pi Lamda Phi. Snowden anticipates graduating in May with a bachelor’s degree in music, with a concentration in guitar performance. His career goal is to become a music therapist. Snowden is a graduate of Bishop McNamara High School in Forestville, Md.